As you can imagine, Barack Obama's speech about race is the talk of the town today. I happened to catch a replay of it just before a panel discussion here on racial equity - an experience I posted about at DemocracySpace, my nonpartisan day job blog. Check it out. I thought the "A More Perfect Union" speech was one of Barack's best yet - and that's saying something. If you missed it, you can watch the video and/or read the transcript here. I also really liked the NPR coverage this morning, wherein reporter Ben Calhoun pointed out that the Biblical prophet Jeremiah - like Obama's former pastor - was "thrown into a pit and left to die because he didn't seem to love his country. But in reality, it was Jeremiah's love for his country that drove him to point out his nation's problems." Number one, until we end the war in Iraq, we'll be unable to address other pressing issues in our nation, and the continuation of the war is the main factor driving the worsening economy. Many Democratic policy analysts and spokespeople are starting to call the slowdown the "Iraq Recession." Number two, "Is the surge working?" is a largely irrelevant question. Instead, voters and candidates need to be asking "What do we do about Iraq to make our nation stronger and safer?" Ten congressional challengers answered the latter question Monday with "A Responsible Plan to End the War in Iraq," unveiled at the Take Back America conference and online. Their main point is that we can end the war responsibly, rejecting the conventional wisdom that our only good choices are endless occupation or a destabilizing withdrawal. Other key aims include using U.S. diplomatic power, addressing humanitarian concerns, restoring our Constitution, restoring our military, restoring media independence, and creating a new, U.S.-centered energy policy. But the economic argument for ending the war may well have the most traction this election year. "We have a bridge in my district that's about ready to fall into Lake Washington and we can't repair it because my district's sending all its money to Iraq," said candidate Darcy Burner of Washington's 8th District, who organized Monday's event. In fact, the war's $526 billion cost to date has cost each U.S. family of four $16,500 and each congressional district more than a billion bucks. Burner said that when she asks people in her Puget Sound-area district what they'd do to improve the economy, most say "end the war." The war's effect on the economy clearly needs to be a factor in the presidential and congressional races, and I hope to see our Idaho candidates embrace this plan. But savvy state legislative and even local candidates must realize that the war's costs are crimping our ability to provide essential services at every level of government, from repairing roads and bridges to maintaining state National Guards. It's time to stop the bloodletting, both in human and economic terms. Take Back America is a great place to spread word of your cause. These people were wearing St. Patrick's Day green Ts with the message "I have to pay back HOW MUCH?" to raise awareness about college students' growing debt loads. It's midday at Take Back America 2008, and here are some highlights from the first morning. I will add photos later. 9:45 a.m. - The Rev. Jesse Jackson stops me in the hall and asks where the opening session is. Unfortunately, I have no idea. 10 a.m. - I check in at Blogger Boulevard, where I see some folks I met at the summit, including Pam of Pam's House Blend and K.T. and Karl from Burnt Orange Report. David Neiwert from Orcinus is there, too. 10:10 a.m. - I meet Wendy Schultz, whose husband Ed (pictured here) has the nation's top progressive talk show (airing from 4 to 7 p.m. weekdays on AM 630 in the Treasure Valley, by the way). 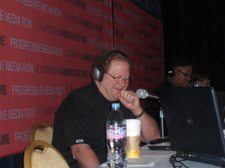 Ed is on the air, so I ask Wendy to see if Ed will come to Idaho to do his show sometime. I also mention that U.S. Senate candidate Larry "Rocky" LaRocco would be a great guest. 10:30 a.m. - The opening session is under way. Robert Borosage of the Campaign for America's Future - the sponsor of the convention - says the only question is whether November 4 will bring merely a "change election ... or a sea change election." For the latter, he says, progressives need to craft a mandate similar to that with which the Reaganites came to power in 1980. The rest of the session features three speakers who address the main parts of such a mandate: Health Care for All (Diane Archer), New Energy for America (Van Jones), and Getting Out of Iraq (Donna Edwards). 10:50 a.m. - Speaking about a new clean, green economy, Jones explains how millions of new jobs could be created and we could wean ourselves from foreign oil through building weatherization; the development of solar, wind, and wave energy farms; and other green-economy jobs. "This is the work that most needs to be done. We need to connect it to the people who most need the work," he says. As an aside, Jones - a 39-year-old black man - notes that this is not the time to be talking about race, gender, nor class issues in American politics. "That's the sort of thing we can talk about when the ship is not sinking," he says, adding, "When the ship is sinking, we need to act as if we're all in this together, because we are." Jones gets huge applause when he says, "We can do more than take America back. This movement is about taking America over." 11:10 a.m. - Donna Edwards, who recently wrested the Democratic nomination in Maryland's 4th Congressional District from eight-term DINO (Dem in Name Only) Rep. Albert Wynn, delivers a strong case for leaving Iraq. Although Democrats had a mandate to end the war after capturing Congress in 2006, we've failed to do so, she says, because Republicans say that by ending the war, we'd be failing to support the troops. Actually, she said, supporting the troops means getting them out of harm's way. A former Lockheed employee, Edwards says that "ending the war is not rocket science" and adds, "In 2008, the voters get it and it's time for members of Congress to get it, too." Even if we can't get it done in 2008, she adds, with larger progressive majorities in Congress and a Democrat in the White House, we will get it done" in 2009. 11:55 a.m. - Kicking off a wide-ranging panel on "The Crackup of Conservativism," moderator Rick Perlstein screens a video about Ken & Barbie, then unveils his counterpart to the tired phrase "limousine liberals." ("Yes, I'm sure we all arrived in Lincoln Town Cars," he cracks.) He calls them "E coli conservatives," or conservatives that object to even the most sensible governmental regulation and oversight. He is joined by Cliff Schecter, who has a forthcoming book, The Real McCain: Why Conservatives Don't Trust McCain - And Why Independents and Shouldn't; state Rep. Krysten Sinema, who led the campaign to defeat a gay marriage amendment at the ballot box in Arizona in 2006; and Mike Zielinksi of the United Steelworkers, who have kicked off a "Stop Toxic Imports" campaign to show why conservative policies are tied directly to the rash of toy, food, and other consumer product recalls we've seen in recent years. Schecter sums up the panel by noting, "Conservativism today is a philosophy of theocracy, oligarchy, and permanent war." 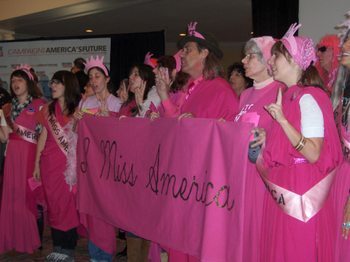 It wouldn't be a progressive gathering without Code Pink, seen here doing their thing before the "Out of Iraq" panel.